I want to first say thank you for speaking to our MAC class last week. Math was certainly not my subject in high school, and I think some interactive projects like the ones you suggested would have gotten me into it a lot more. As for this intro to exponential functions, what a great way to connect classroom material to students’ lives. 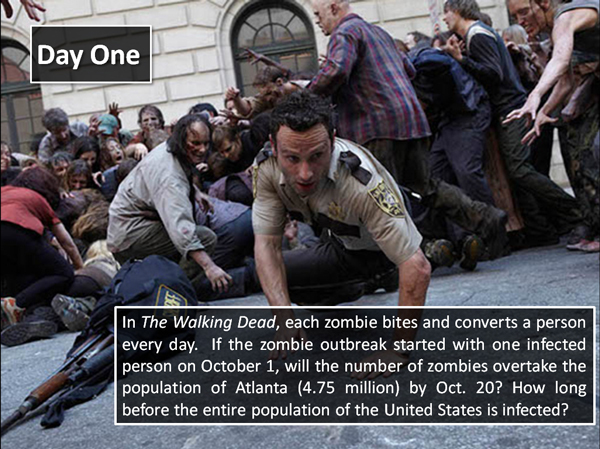 As a history teacher, I am constantly on the lookout for ways to do this with my students, and while I’m not sure I could connect The Walking Dead to anything in my American History class, I’d like to integrate some pop culture into my curriculum.